Aunt Brenda circa 1949. Matt Dillon would have been proud. I decided to share this story for those of you that have gotten concerned about your own protection and safety and peace of mind due to the ever-occurring mass shootings across our nation. My hope is that this little story might encourage you to get beyond your fear of guns and shooting and such so that you can take personal responsibility for your safety and those around you. Somewhere around the middle of November 2012 my 68 year old Aunt Brenda called me from up in Dallas. She wanted to get some information about carrying a concealed weapon. I was a bit surprised. As long as I can remember she has been very scared of guns, bullets and shootin’ and such and pretty much didn’t want to be around them or have them in the house. They made her very nervous and understandably so. When she was a little girl, while playing with her dolls on the living room floor, her younger brother accidentally shot her with a pellet rifle right in the chest. She was rushed to the hospital where she survived the shot. The surgeons at that time were reluctant to remove the pellet as it was lodged somewhere in a critical location near or in her heart. They were concerned that removal would cause her death. Not sure what they eventually did, but it worked. After expressing my surprise, she explained her change of mind. The mass shootings and all the bad stuff that she had become aware of had gotten her attention as she noted that the frequency of these shootings were escalating to a point that she was unsure of her own personal safety. So much so that she was determined to conquer her paralyzing fear of guns and make it legal to have one with her all the time. I was indeed impressed at the determination I heard in her voice. My advice to Aunt Brenda was to go to a nearby reputable firing range and tell her story to the folks there that she was a “never shot a gun before” individual that was determined to get her concealed carry license. Can you help me? So, she did just that. They were very helpful and she recieved some valuable needed information about shooting and what it took to get here concealed carry license. Determined to carry it through, she got in some supervised shooting at the firing range with some pistols to see what pistol might work for her. Fortunately, she had some gun knowledgeable friends that had a 16 acre farm north of Dallas that offered to help her. Her friends loaned her a 9mm Glock 17 and helped her with a lot more shooting on their land. This really helped her get used to the feel of the gun and get acquainted with the recoil of the weapon. She said the most challenging was getting used to the loud noise that thing made. They loaned her the pistol to use during her qualifying for the license. Aunt Brenda is about 5’3″ tall and maybe weighs in at about 115 pounds. Not a tiny person and not a physically weak person but not a bit ol’ girl that can whup ya. 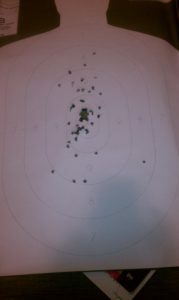 The Glock 17 turned out to be just about right for her. Enough weight to minimize and tame the recoil of a 9mm round but not so much weight that she couldn’t hold it up steadily to fire 50 rounds accurately through it. With practice she quickly learned how to load the magazine correctly and conquered racking the slide back to charge the weapon with a live round which is a Texas requirement with a semi-automatic pistol. She found that the trigger on the Glock was smooth and easy, not presenting a great challenge to master for a “first timer”. A couple of months later in mid-February, I got a call. 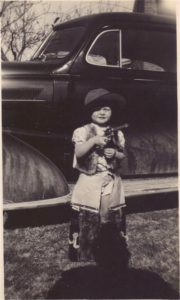 The caller identified herself as Annie Oakley. She was very excited as she had just come from the range where she had passed her written exam the day before with a 98 score out of 100 and had just passed her qualification shooting test with a score of 250 out of 250. Made me cross-eyed for a moment. That’s a perfect score! In my three times of testing over the years I never shot a perfect score. She emailed me a photo of her qualifying target and sure enough, perfect score. In Texas, any round that strikes the target within the #8 ring counts as 5 points. Maximum score is 250. If you shoot all 50 rounds into the #8 ring on the man sized B-27 target that is 250 points. Below is her target. Good shootin’ there little missy! You can ride shotgun anytime.